"You in the chaos feigning sane"
When I look at the Tarot garden, I think of the sun in Tuscany; how it spilled onto our shoulders and the tips of our noses. The sculptures were so warm to the touch, so inviting, we entered them. 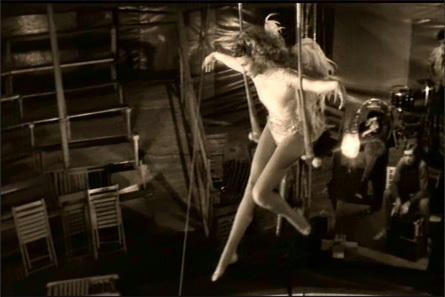 It was like being in a friend's gigantic doll house, or a hall of mirrors, shards of reflection, refracted light. Angels keep showing up. Different forms and disguises, but so far, not on the head of a pin. I love Niki's Angel with her generous torso, big bosom & those wings that seem strong enough to carry an ample Angel. 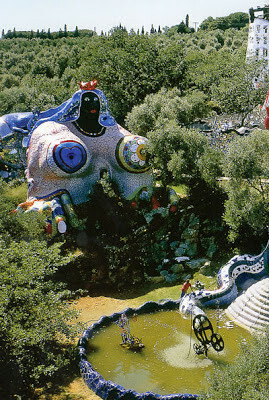 She lived inside "The Empress" for seven years while she made the models for the remaining sculptures. 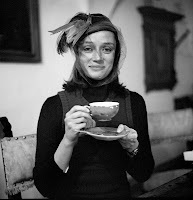 She looks like a happy bird here in 1976 sipping her "cuppa", but she didn't know then that it would take 20 years to build her sculpture garden, which is why she made the Angel of Temperance--having learned the value of temperance while working on her "garden"--for her it meant you can't always do or have what you want! 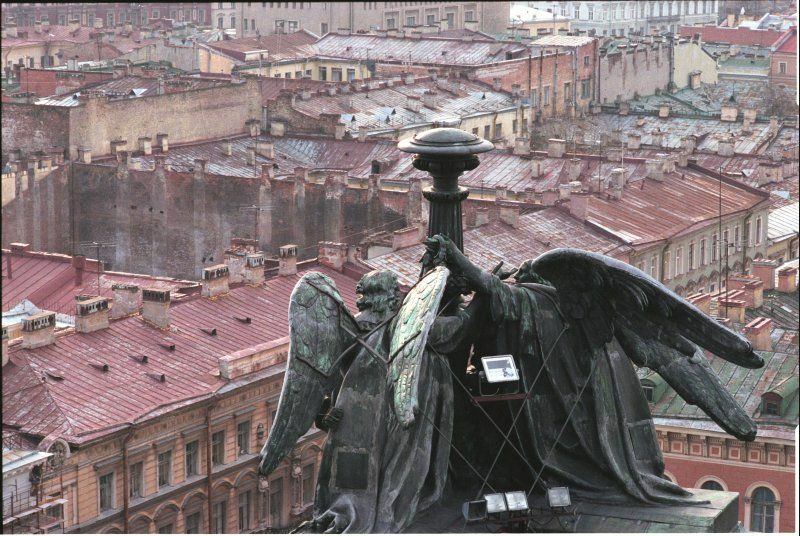 So that set me to thinking about "Temperance", since her angel does have wings and theoretically could fly, but instead of flying, she is a bit of a domestic Goddess perched on her Shrine. 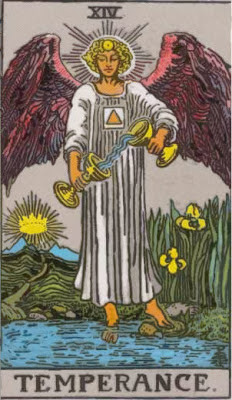 Many of the definitions around Temperance and the Tarot have to do with "balance", thus it seems fitting she is standing on one leg! A balancing act, just the way Niki is balancing her tea cup and saucer, smiling with her eyes. 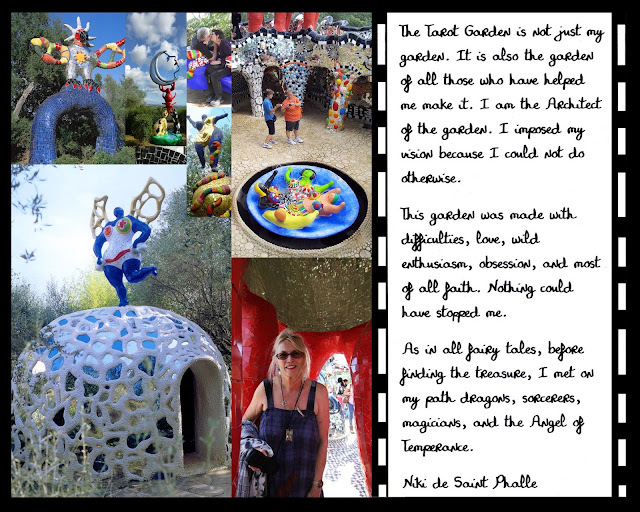 Little did this nouveaux realiste know that she would die of emphysema as a consequence from years of inhaling toxic polyester fumes while working on her sculptures. Or maybe she did know and just kept going. A l'époque (back in the day), I also worked with toxic fumes/dust, as a ceramicist for over 20 years: sculpture, raku, pit firing, high fire porcelain, tea bowls, you name it, I made it. I knew the dangers of inhaling the silica dust, amidst the sirens of color: those purple blues/acid green metallic oxides. Several of my potter friends had silicosis. 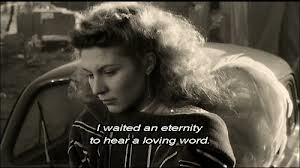 But that didn't stop me--I was passionate about clay--something else did. leggy mint and suspicious mushrooms. plenty of spiders and athletic mice for company. pronunciation of "tea" - tay! tay! tay! "Night of the Living Dead" -- Romero, jah, he is a genius! argile back to Berlin. That's how good the clay is. Well, the euro is strong--go figure. Myself, I wouldn't touch the clay again. a sort of muddy grey. Every blade of grass has its Angel that bends over it and whispers, "Grow, grow"! 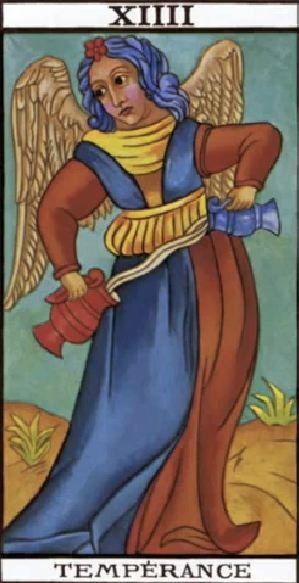 CASSIEL/CAFFIEL-- the Angel of Temperance--one of the seven archangels (the "Angels of Presence") must have been hanging around me in those days. 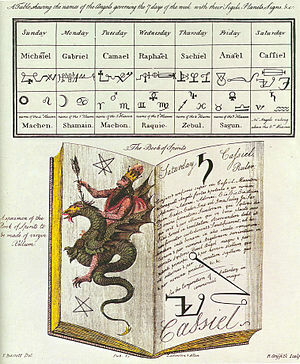 Cassiel of the planet Saturn, pointing north, controller of the moon. Seems he's got loads of other names so it can get confusing. His Hebrew name is Kafziel and his Egyptian monikers are Nepthys and Horus. In the magical text Berit Menuchah, Cassiel is associated with Kefitzat Haderech, the ability to travel quickly through space. Magic spells cast using his name can create destruction, scatter crowds, cause a person to wander aimlessly (that was the spell I must have been under), or to fall from a position of power. On the other hand, unlike many other angels, Cassiel is known for simply watching the events of the cosmos unfold with little interference. 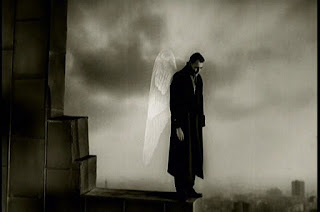 He is the angel of solitude and tears and is said to preside over the death of kings. 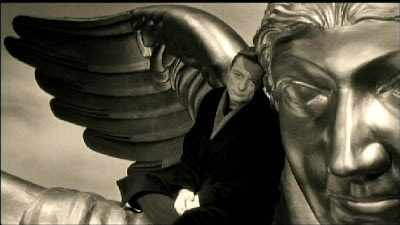 In Wim Wender's film meditation, "Wings of Desire", the immortal angels, Cassiel and Damiel, travel through the city of Berlin listening to people's thoughts, witnessing & comforting the human beings trapped in the material, the finite. Finally they desire to become mortal, to fall and taste the blood and caffeine of life, to mingle the worldly and the divine. 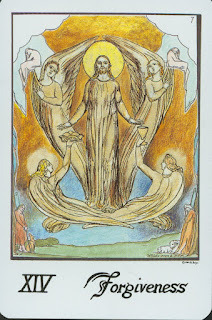 For Meister Eckhart, angels represented "ideas of God"; we think of them as winged messengers from heaven, representing inner experiences of a numinous nature which connects us to the archetypal world of the unconscious. Jung believed an angel personifies something new rising from the deep unconscious. 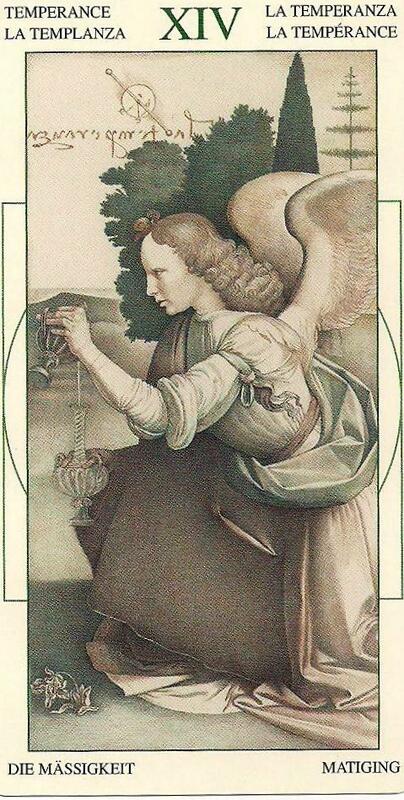 He defined angels as "personified transmitters of unconscious contents which announce that they want to speak." 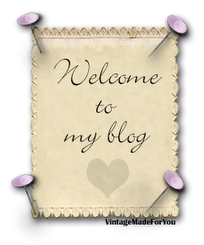 It's possible to establish an inner dialogue, a living relationship to the "other" within. The alchemists used this method which Jung called "active imagination". They called it "meditatio". Ruland the Lexicographer defines meditatio as "an inner dialogue with someone who is invisible, as also with God, or with oneself, or with one's good angel." I've always liked the Lincoln quote: "...The mystic chords of memory will swell when again touched, as surely they will be, by the better angels of our nature." 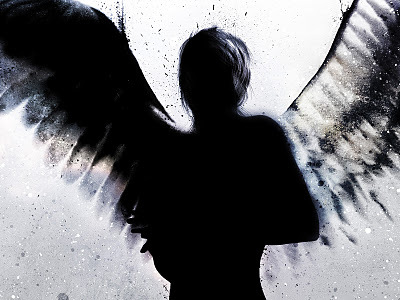 But let's not forget that there is a "dark angel" there too, as angels, like all archetypes, are creatures of questionable morality, look no further than "The Devil", the fallen angel that follows Temperance. "Who can have lived his life in solitude and not have marveled how the angels there will visit him at times and let him share what can't be given to the multitude." When we are most alone, bereft and broken, & the ego has lost some of its vigilance, it is possible to receive a healing message that seems to come from outside our ordinary awareness. 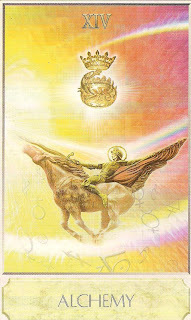 In the wonderful William Blake Tarot of the Creative Imagination deck by Ed Buryn, the XIV card is FORGIVENESS. And in the J. Philip Thomas deck, XIV is ALCHEMY. In the Tarot de Leonardo De Vinci, made in Torino Italy by Lo Scarabeo, Temperance is in the driver's seat and she has wings. 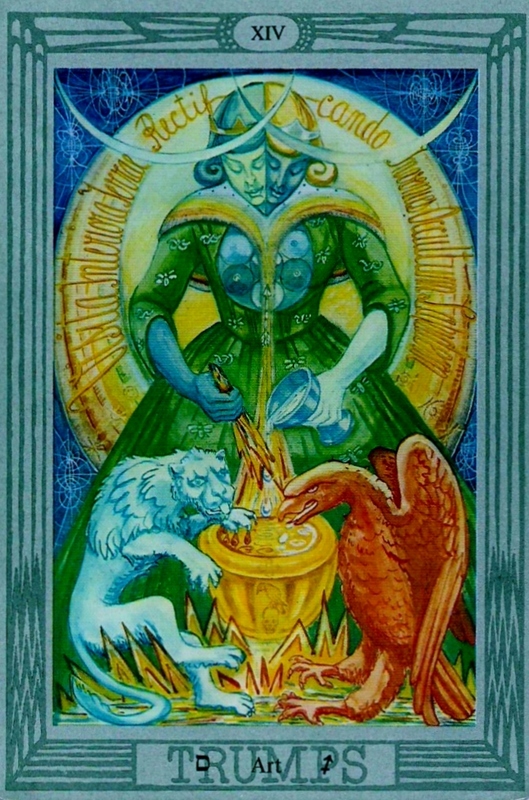 It's not a stretch to believe that Leo had contact with the Tarot, since he visited the Milanese court of Ludovico da Sforza who commissioned tarot designs the earliest of which date back to 1450. In the Middle Ages, people believed that the body contained "tempers" that controlled the health as well as behavior. If one fell sick or "lost it", becoming unbalanced, this card showing up could indicate a need for moderation. It is also one of the "victory" cards symbolizing a need to overcome a bad habit, to seek out our divine angel within. In the Waite deck, Temperance has one foot on a rock and one foot in the water, blended energy of emotions and groundedness. The Iris growing at the edges (from Greek mythology) can mean oaths taken by the Gods -- the card signifying a commitment to a new way of life. To avoid "temp-tation". A silk worm eating leaves makes a cocoon. Each of us weaves a chamber of leaves and sticks. and open its silent wings." Ah, Rudy this came just at the right moment. 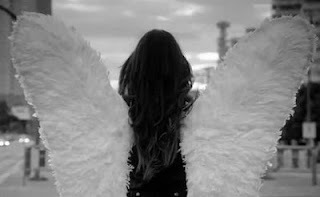 I feel the angels surrounding me now as I suffer from a broken heart. This line speaks for me: "When we are most alone, bereft and broken, & the ego has lost some of its vigilance, it is possible to receive a healing message that seems to come from outside our ordinary awareness." Thanks Rudy, I do feel surrounded by angels.